Our tiny shooting shooting star sing ear thread earring is inspired by the good wishes brought by these serendipitous celestial lights. 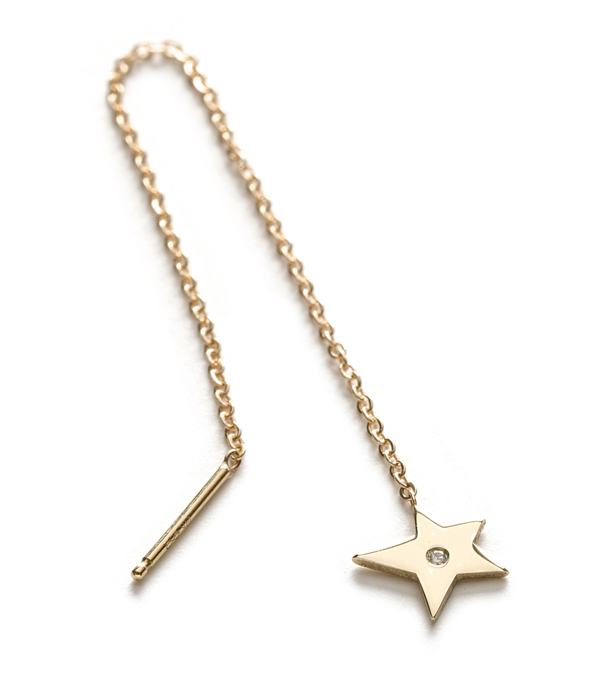 This dainty single ear thread is a lovely little way to say good luck to a cherished friend. Half the fun with earring singles is creating unique messages with the symbols you pair together. We love the this petite single ear thread paired with our tiny crescent moon earring in a second hole. These minis make a unique gift for your favorite person. Mix and match several talismans to create your own secret messages. This mini 14K yellow gold and diamond shooting star stud ear thread is sold individually, not in a pair, and is hand made by our artisan jewelers in Los Angeles. Categories: Charming, Earrings, Under 500.